Tosia is a geometric sans serif typeface created by Roch Modrzejewsky and published by ROHH which comes in 10 weights (from Hairline to Black) matching italics, a wide range of OpenType Features and extended language support. This modern, elegant, neutral, legible and versatile font can be suitable for any kind of project from headline (in all sizes) to screen use, web applications and print project. Have fun! 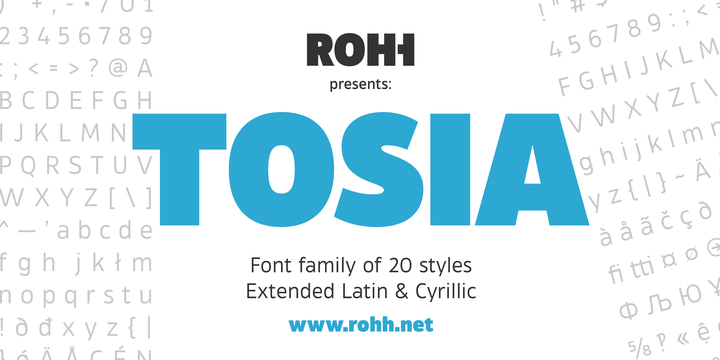 Note: “Tosia” is a trademark of ROHH. Price: starting from $40 for one font to only $180,00 for all 20 fonts. A font description published on Wednesday, May 25th, 2016 in Fonts, Roch Modrzejewski, ROHH by Alexandra that has 2,492 views.